The Nokia 5 has been announced at MWC 2017, along side the Nokia 3, Nokia 6 and a reboot of the Nokia 3310 at MWC 2017. HMD Global has promised regular updates to the stock clutter Free Android 7.1.1 Nougat operating system which the phone runs on. The Nokia 5 has a full metal body, and sports a 5.2-inch IPS LCD 720p HD display, with an aspect ratio of 16:9, 2.5D Corning Gorilla Glass, and a brightness of 500 nits, with Sunlight visibility and polarizer. The device is powered by an octa-core Qualcomm Snapdragon 430 processor, with 2GB of RAM.The phone has 16GB of storage, and supports up to 128GB of expandable storage via a microSD card slot. The Nokia 5 features a 13 megapixel rear camera with phase detect autofocus with dual LED Flash, and a 8 megapixel front camera. 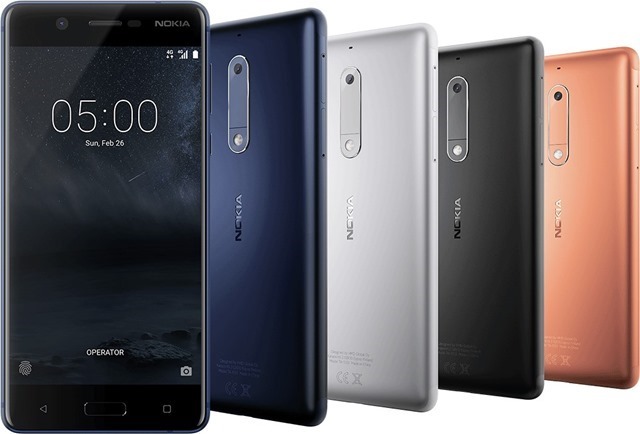 The Nokia 3 supports NFC, 4G LTE connectivity, and will be available insingle SIM and Dual SIM variants. The phone is backed by a 3,000 mAh battery, comes with a Smart amplifier (TFA9891) has an accelerometer, gyroscope among its variety of sensors. The Nokia 3 will be available in 4 colours: Tempered Blue, Silver, Matte Black, and Copper. The Nokia 3 has been priced at €189 (Europe), which is about Rs. 13,300 or $147.